The National Research and Education Network (NREN) is an essential collective of infrastructure, tools, and people that bolsters Canadian leadership in research, education and innovation. 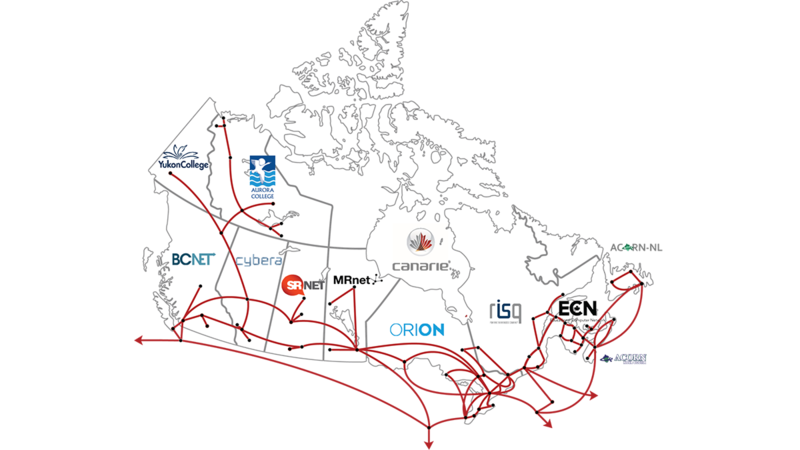 CANARIE and its twelve provincial and territorial partners form Canada’s NREN. The NREN connects Canada’s researchers, educators and innovators to each other and to data, technology and colleagues around the world. As the B.C. partner in Canada’s NREN, the BCNET Network connects B.C.’s research and education institutions to their peers regionally, nationally and around the world. The BCNET Network extends over 9,980 kilometres and directly connects 179 colleges, institutes, research universities, federal and provincial labs and research institution sites in British Columbia. If you are a member of BCNET, you may be already connected to the NREN. If you’d like to connect, contact us at info@bc.net. Thirteen provincial, territorial and federal partners form Canada’s NREN. More information on each partner, along with a link to his or her website, may be found below. Want to know more about Canada's NREN?